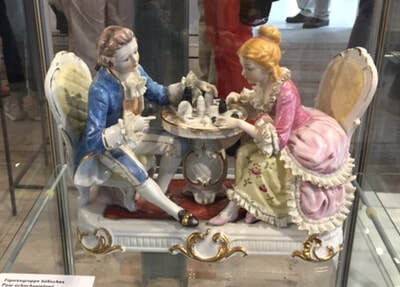 8..9. 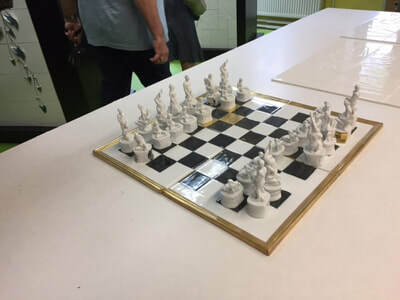 - Year by year, the CCI section in Germany keeps smoothly rolling off a yearly meeting in idyllic stations - and this time around was no exception. Shunning the larger cities , again this meeting was set in a small and peripheric city, but with a novelty twist: the participating collectors stayed in a hotel across the Czech border, in the lovely and historic spa of Frantiskove Lazne (= Franciscus' Spa). 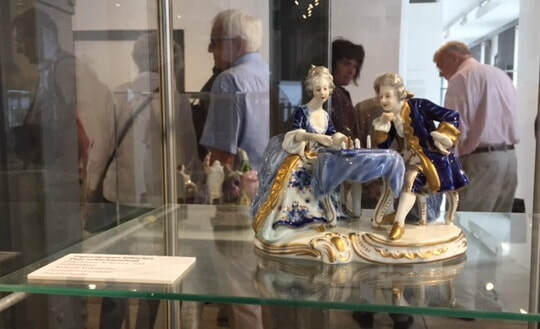 This is mainly due to the impetus and invitation of porcelain artist Barbara Flügel who runs an internationally renowned studio and workshop for porcelain in Selb on the Bavarian border, and who managed to open all kinds of doors for the assembled crowd. 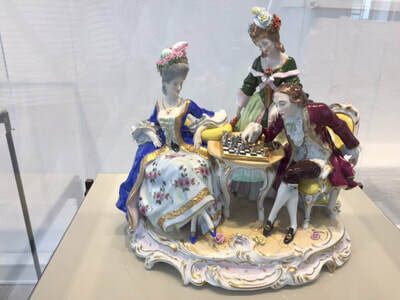 known in Europe for the various chess events he has set up and continues to run - for many years "Snow Drops against old hands " (last venue 2013) pitted young female grandmasters against experienced chess seniors like Vlastimil Hort or Robert Hübner - and for the annual matches of the Czech number one chess player GM David Navara against a strong opponent - this years sparring partner for Navara was Rapid Chess World Champion Vlastimil Ivanchuk, who won the match 7.5 to 4.5. 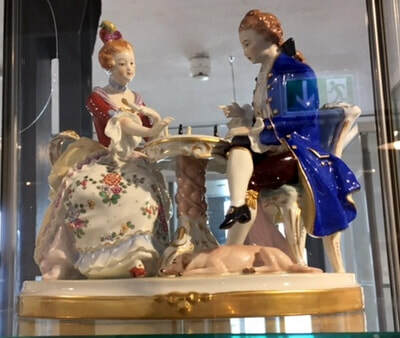 After lunch in an idyllic restaurant the collectors group was whisked off into the Porzellanikon - a unique Museum dedicated to porcelain which is housed in a former manufactory. The whole massive gamut of porcelain manufacture in Germany from Meissen downwards to Nymphenburg and back is assembled in this impressive show - but for the CCI crowd the cherry on the cake was the special exhibit of porcelain ches sets, organized by Thomas Thomsen , mainly with pieces from his own collection. 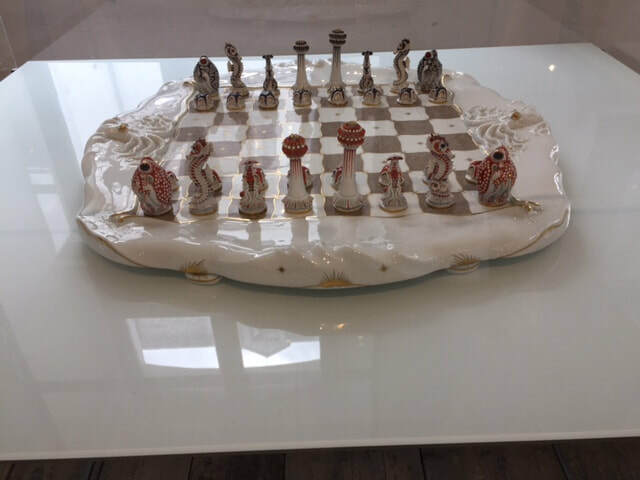 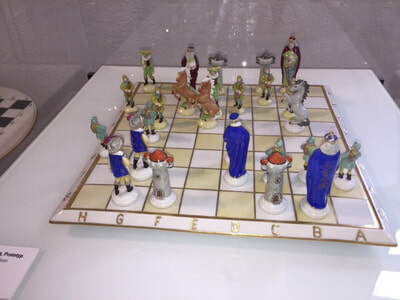 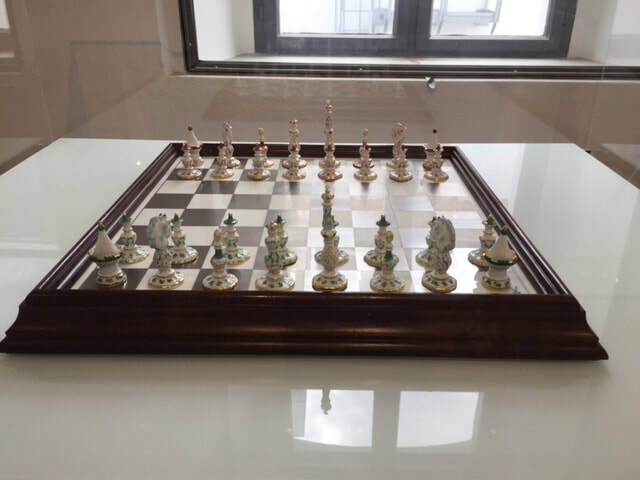 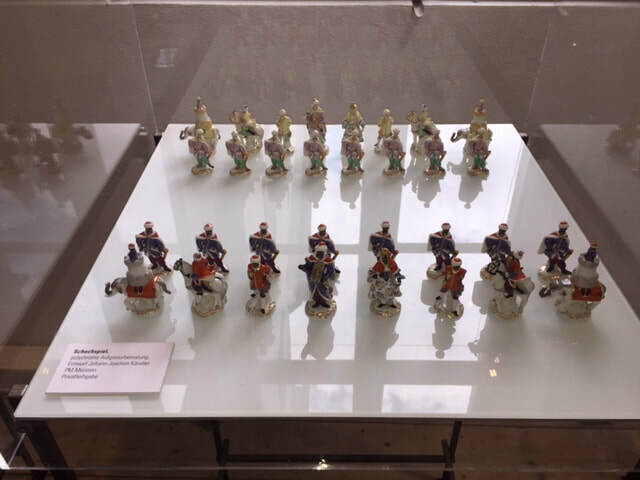 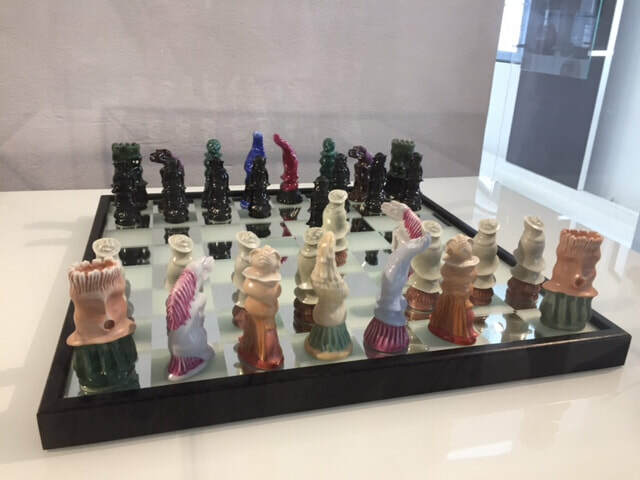 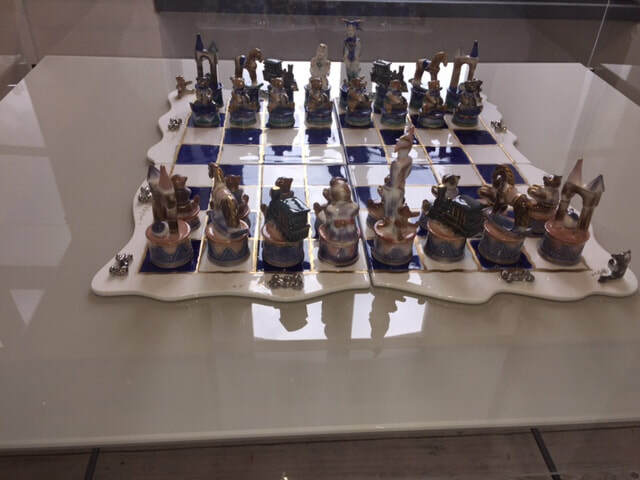 Over 100 chess sets were on display - the famous Moorish set by Kändler/Meissen, the modern Meissen sets by Max Esser, a very rare Ludwigsburg set and many others from Lladro via Cmielow over Vista Alegre to Augarten, Castleford, Royal Doulton, Volksstedt, Rudolf Kämmer, Höchst manufacture, the Lomonossow propaganda set, several more recent set from Gzhel by Juri Garanin and many others. 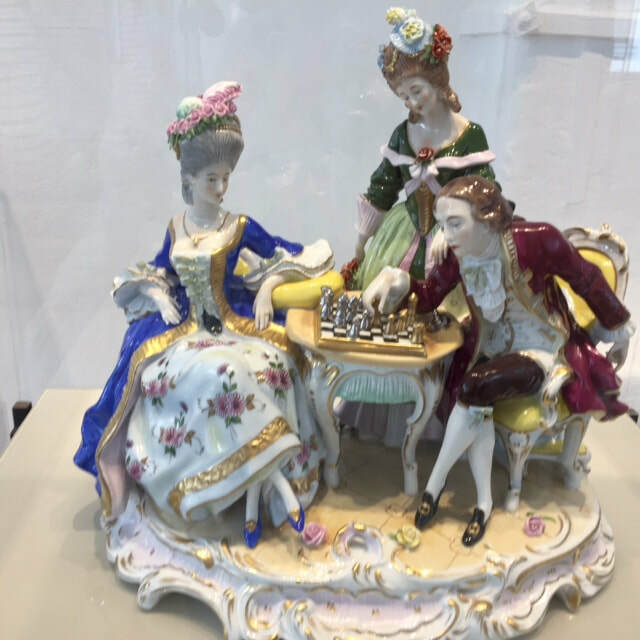 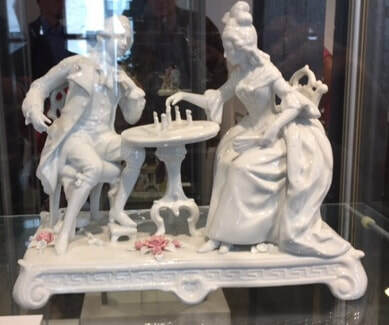 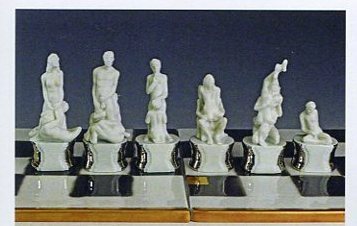 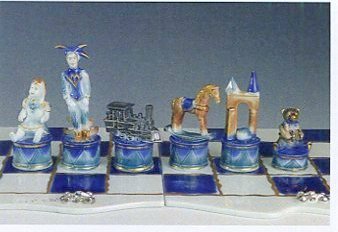 Nobody has ever witnessed such a large show of porcelain and chess - the Museum was so impressed they resolved to keep the show on until the start of October! 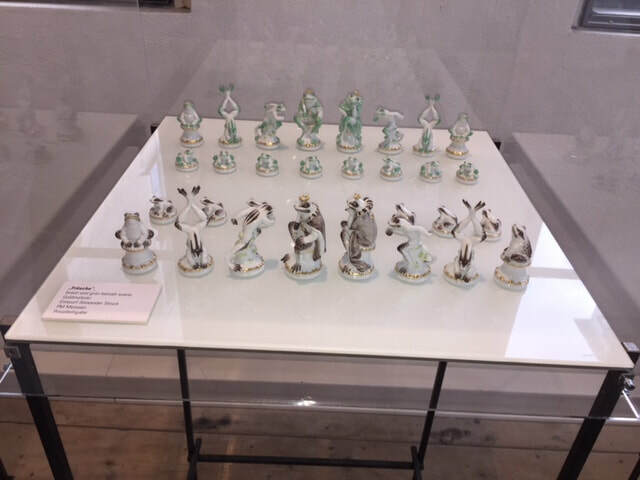 The superb catalogue with all pieces illustrated and described in english and german is an absolute must for anybody vaguely interested - all pieces are photographed, Barbara's demonstration is contained, general information on porcelain has been added in a preface - the brochure is available until the end of the run from Thomas Thomsen (Details under New and Interesting books). 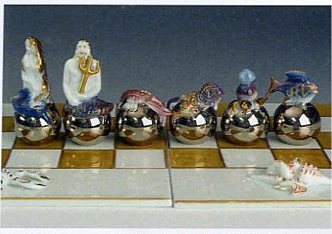 Not the least of the fascination for collectors resides in counting up those sets that still might complete such a spread.....as we know, chess is like the sea "on which a fly may safely land, but an elephant will drown" . 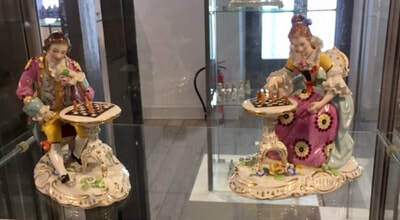 Chess is infinite, and the number of chess sets, even in porcelain, nearly so.... ..as british collector Tony Rainey used to state emphatically: " Porcelain is the thing to collect, the rest is just stuff...."
Later in the afternoon, the collectors troupe moved on to the nearby village of Wunsiedel, for an early dinner in cosy sdigs, since most of the visitors were scheduled to see an open-air performance of the musical "Cats" - isn't it astonishing how longlived these Andrew Webber shows have become - almost modern classics. 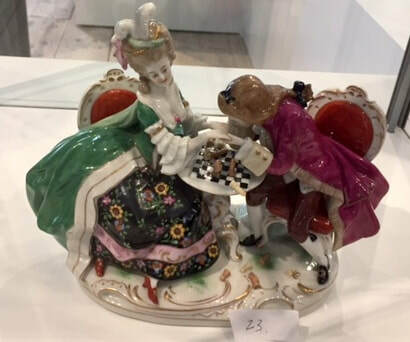 With the last cat expiring in a screech, no time was left for exploring the potentially steamy Wunsiedel night life, as the bus was on hand to waft everybody back 30 miles over the border to Frantiskove Lazne. Saturday was reserved for the more traditional points of a CCI meeting - with a dense programs of lectures. 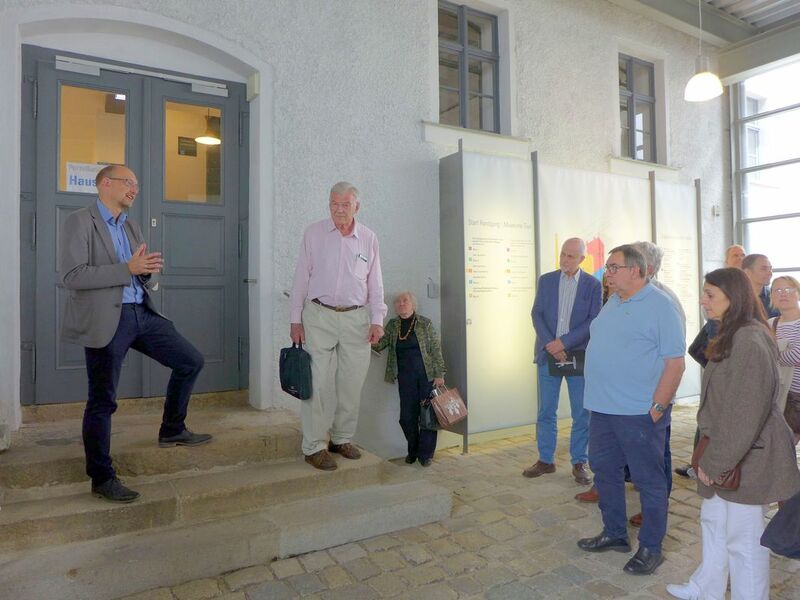 Thomas Thomsen and Wolfgang Angerstein welcomed the participants, and briefly informed on current affairs in CCI. 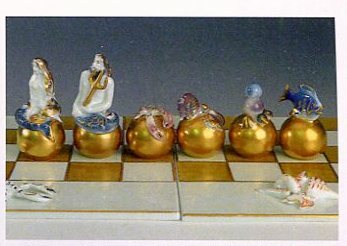 Following that , Jens-Frieder Mükke showed a rather unique chess set from carvers in the Kleine Walsertal, an idyllic valley on the Austrian-Bavarian border, with an old carving tradition. 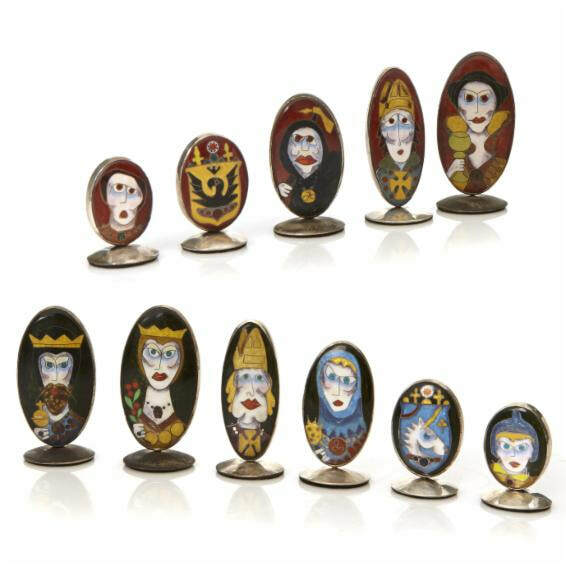 Thomas Thomsen presented the rare Ludwigsburg set he owns, and which seems to be modelled on a 16th century wooden carved set from the Bavarian National Museum in Munich, and which was also duplicated by the Capodimonte manufactory in Naples later on. 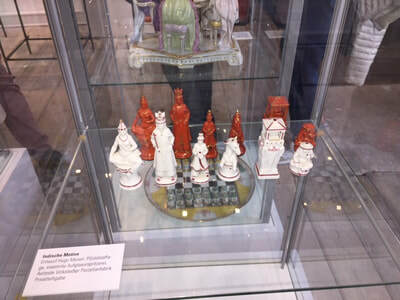 Wolfgang Angerstein has a weakness for Gzhel chess sets, of which he owns a sizeable amount, and explained the whereabouts and changed situation in Gzhel after the demise of the Soviet Union. Coffee break permitted to discuss some of these trouvailles - and then Maria Schetelich, lecturer on Asian Culture at Leipzig University, gave a highly inspiring talk on the knights round as a recurrent mathematical and chessic problem over time. 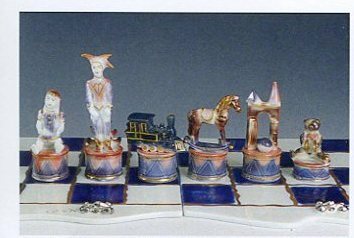 Franz Josef Lang talked about the use of chess in political caricatures in France, with copious illustrations from his collection. 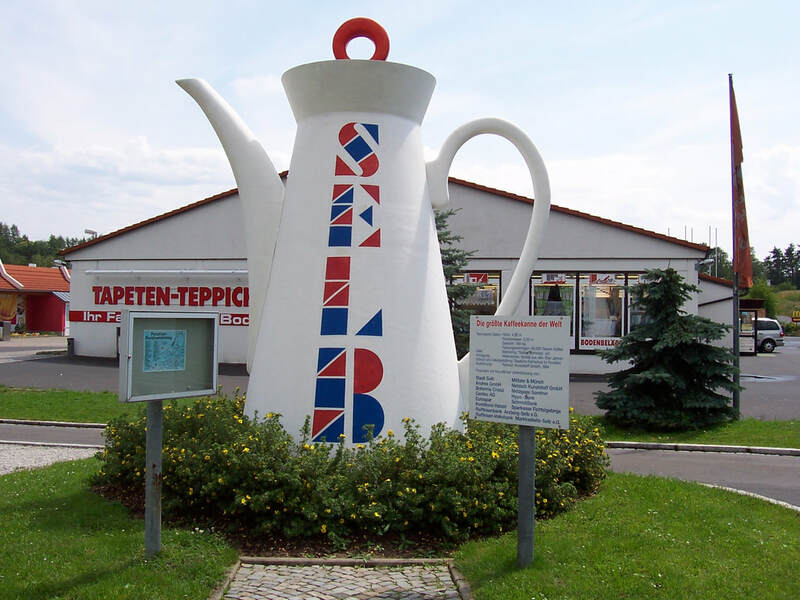 Finally Thomas Thomsen provided a short introduction to the history of Eger relief intarsia , in preparation for Sunday's planned excursion to nearby Eger (Cheb). 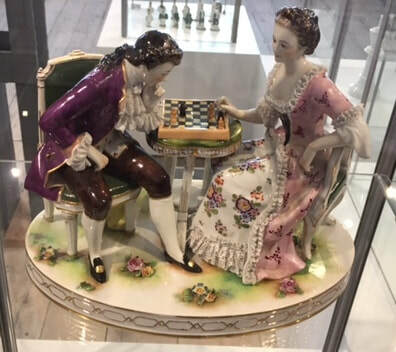 After lunch the collectors chess market provided a certain degree of excitement for all involved - whether good deals were struck, massive amounts of money changed hands, or whether perchance the sellers outnumbered the buyers, I have no clue as I was not present! In any case, in the evening everybody dressed up to amble across town to the local Casino for a gala diner, enlivened by Michael Negele giving a highly entertaining talk about great sponsors in chess (see here ) . 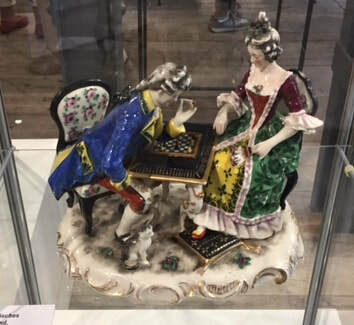 Sunday was dedicated to a visit to the nearby medieval town of Eger, home of the famous intarsia relief technique which produced some extraordinary pieces of furniture, as well some of the most prized chess boards we know. 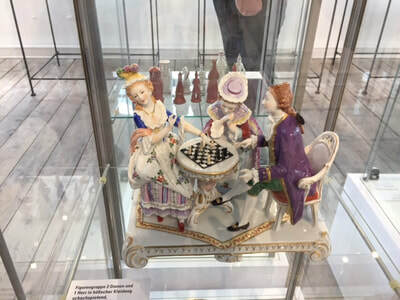 Eger - today better known under the Czech name of Cheb - is a lovely restored city with a medieval castle, a baroque town center and a smartly equipped local museum, which exhibits two of the prized chess boards. Oddly enough, the Museum occupies the house in which the imperial general Albrecht von Wallenstein was murdered by a fellow officer in 1634, an earth -shaking occurrence in its day, celebrated by the poet Frederic Schiller in a dramatic theater piece, as well as by several other authors in stories, poems and histories. The morning ended back in Frantiskove Lazne with a last lunch in the hotel - then it was time for everybody to make their move!